These digital eyepiece cameras are designed to work with most microscopes including biological/compound, inspection/dissection, and stereo microscopes. Great for observing live images on your screen and still images. This digital eyepiece camera hooks directly to TV input for viewing. Simply remove the eyepiece from the ocular tube of your microscope and insert the eyepiece camera. Designed to work with both Biological and Inspection Microscopes. Great for bringing images and video to your computer screen. 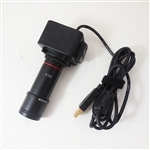 This 5.0MP Digital Microscope eyepiece is inserted in place of the normal optical eyepiece. The camera is attached to a computer by am included USB cable. The 5.0MP 1/2.5" true color CMOS chip can provide 2592 x 1944 resolution via imagery or video at 15fps. Lower resolutions can provide higher framerates. Software is included and operates on Windows XP through Windows 8. 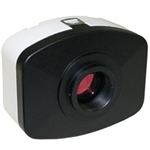 DN Series cameras are new generation routine cameras with high resolution. They offer Plug-and Play compatibility and come with user-friendly, efficient imaging software. An excellent choice for research, medicine, education and industry applications. Plug-and-Play compatibility allows you to connect more than one cameras in one PC at the same time. Compatible with Windows XP, Vista, 7, 8, Linux and Mac operating systems. Resolution 1.3 MegaPixels, Maximum Resolution 1280 x 1024 at 15 frames/second. CD with software, driver and user manual. NOTE: This item has free shipping in the Continental US. For HI, AK, PR and international users please contact us. Affordble, high 3.0 Megapixel resolution for your microscope. Affordble, high 5.0 Megapixel resolution for your microscope.